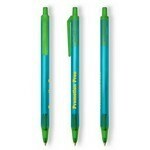 Our Astro pen features sleek and stylish design and allows adding brand logo for an amazing Personalized Swag! 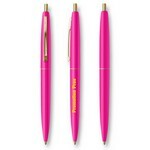 The Belize Pen - Pink is designed with a comfort grip and translucent barrel, ideal for imprinting your custom logo on! 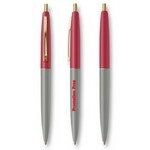 Our personalizable gold Bic clear click pens feature a single custom logo imprint and a wide-variety of color options. 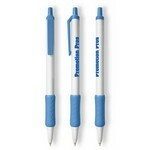 Our custom printed BIC clear click pen features a single custom logo imprint and a wide variety of color options. Our personalizable Bic tri-stick pens feature a single custom logo imprint and a wide-variety of color options. 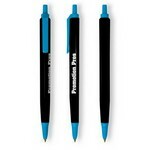 Our personalizable dual color Bic clic pens feature a single custom logo imprint and a wide-variety of color options. 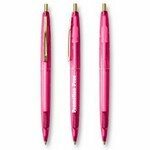 Our personalizable Bic clic stic color grip pens feature a single custom logo imprint and a wide-variety of color options. 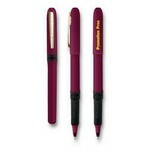 This custom Bic clic gold pens features a durable design, with gold accents for a sleek modern look. This custom Bic clic gold metallic pens features a durable design, with gold accents for a sleek modern look. This custom gold Bic grip roller pens features a durable design with gold accents for a sleek modern look. 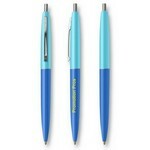 Our personalizable Bic clic stic ice pens feature a single custom logo imprint and a wide-variety of color options.